That question is one of the biggest obstacles we face in our lives. That fear of not being good enough or smart enough or strong enough suffocates us and stomps out our ability to achieve our dreams. As children, we had high hopes and extreme visions for what we would do with our lives. Some of us wanted to be astronauts. Others wanted to be chefs, or doctors, or dog trainers. But at some point, out of fear of the unknown, many of us abandon our dreams and opt for something more “secure”. Instead of shooting for the stars, we decide to take the safer path in order to avoid the risk of falling up short. On a recent Lovesac business trip to Salt Lake City I sat down with Brent Andersen, the founder of the Loveland Living Planet Aquarium. After talking with Brent for a few minutes, I quickly realized he was not one of those people who took the safe road in life. Brent spent his childhood couch life being deeply inspired by Jacques Cousteau and his underwater adventures. He created a strategy to build a chain of aquariums and a research vessel. His purpose: to help educate the world on our fragile ecosystem, with the notion that: “We are all connected,” and that we need to understand that. 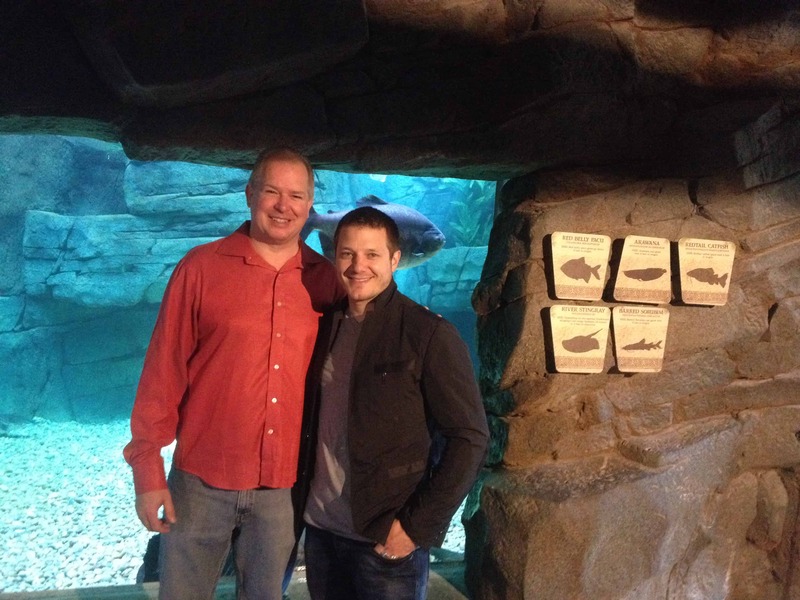 Brent Andersen and myself at the Living Planet Aquarium in Utah. Brent is an entrepreneur’s entrepreneur. Even in the face of every possible adversity, he pushed forward to achieve his ultimate vision. As an entrepreneur Brent shared four things that were key to his ultimate success. 1. Think big 2. Persevere, no matter the cost. 3. Surround yourself with smart people, and other entrepreneurs. 4. Once you arrive, keep going. His next step? Hopefully to take his dream to the next level, building more aquariums, and linking them with a network of exploratory ocean vessels roaming the world making new discoveries. Sound too ambitious? Too fantastic? It is. And that’s why I love this guy. The next Jacques Cousteau, and an inspiration to us all. This entry was posted in How's Your Couch Life Interviews, Interviews, Travel log and tagged aquarium, beanbag, Billionaire, blog, celebrities, celebrity, Couch, couch life, Design, designer, entrepreneur, Family, fish, founder, Furniture, home, homes, interior design, interview, inventor, life on a couch, love, Lovesac, Rebel, Sac, Sactionals, Sectionals, shark, sharks, Shawn D Nelson, Shawn David Nelson, shawn nelson, shawny nelson, sofa, television, travel, underwater, water on September 5, 2014 by Shawn Nelson. Like everyone else in the world, the people you see on TV have a life on a couch too. Liz and Marie Canavan, the infamous twins from the Amazing Race Season 19, invited me to their place on Manhattan’s Upper East Side to chat about their couch life. We quickly found that when the girls aren’t on television entertaining millions of viewers, they spend time on the couch just like the rest of us. I never grow tired of seeing how reflecting on our couch life brings back some of our fondest and even most touching memories. The Canavan twins could probably complete every sentence for the other. I think that in the 15 minutes that we hung out on their couch, they actually spoke in unison for some portion of it (something twins are known for). This interview spanned the entire emotional spectrum- carrying the girls from the happiness of sisterly memories on their childhood couch, through the heartbreaking moments they shared upon losing their father, and up to the current uncertainty they’re feeling as they pack up their apartment to live apart from each other for the first time in their lives. Do you have a family couch in your life? One you inherited, got stuck with, or possibly stole from your family like the one that Liz and Marie are about to leave behind in their New York walk-up? This entry was posted in How's Your Couch Life Interviews, Interviews, Your Life on a Couch and tagged beanbag, Billionaire, blog, celebrities, celebrity, Couch, couch life, Design, designer, entrepreneur, Family, founder, Furniture, home, homes, interior design, interview, inventor, life on a couch, love, Lovesac, Rebel, Sac, Sactionals, Sectionals, Shawn D Nelson, Shawn David Nelson, shawn nelson, shawny nelson, sofa, television, travel on August 28, 2014 by Shawn Nelson. With the 4th of July upon us, we pause to recognize the extreme bravery of men and women who stand ready to defend this great nation of ours, and our privilege to feel safe–on our couch at home. We think of the soldiers that have given their lives to protect our freedoms and the troops still fighting on foreign soil today, as well as those ready to ship out when called upon. This year I found myself pondering what exactly it is that drives someone to devote their life to something so dangerous as going to battle. What makes a man or woman, a son or daughter, a father or mother give up the safety of civilian life and place themselves in harm’s way? To understand this I sat down with Lance Corporal Michael Lucas, an Aviation Support Operator for the Marine Corps Reserves. In his early 20’s, Michael took a temporary leave from a fantastic job at Sikorsky Aircraft in Bridgeport, Connecticut and started training to serve our country. Although he is in the Reserves, Michael still devotes his time to training and preparing in the case that he is called upon to fight. During our conversation, I asked Michael what a soldier’s couch life consists of. I also asked him what drove him to join the Corps, and his answer echoed the response that has been given by so many before him- “I love this country”. That patriotism of our troops, that belief that this country is worth giving a life for, is what has allowed us to remain the “home of the free” for as long as we have. 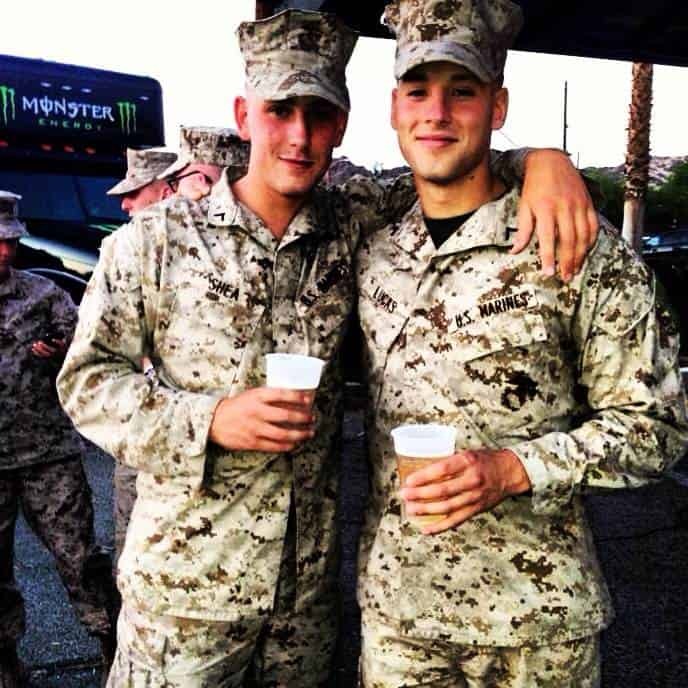 Lance Corporal Lucas and fellow Marine near 29 Palms base in California. It’s sometimes easy to get into the swing of a holiday, grill up some tasty food, and fall into a comfy couch. But it’s so important to remember the true spirit of the 4th of July, a victory of independence from Great Britain, and the lives that were given to gain that freedom as well as the all those devoted to protecting it. Thanks to Lance Corporal Lucas for sitting down with me and telling your story- God Bless you and every other soldier that makes our comfortable lives on a couch possible. 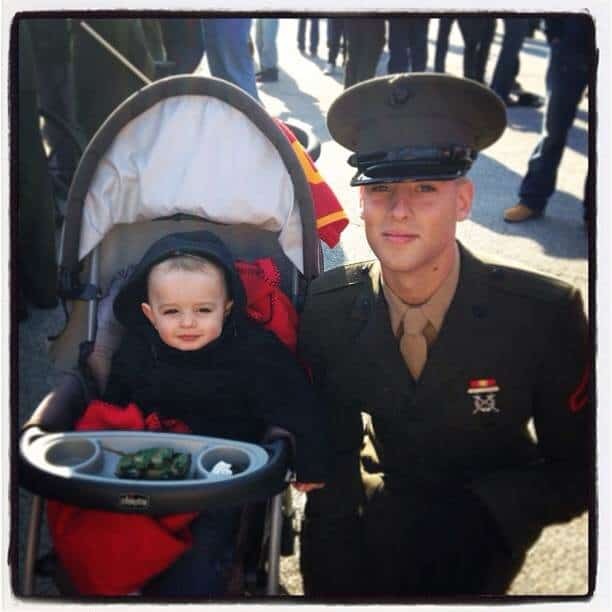 Lance Corporal Lucas with his nephew after graduating boot camp at Parris Island. I am patriotic–and I am grateful. This entry was posted in How's Your Couch Life Interviews, Your Life on a Couch and tagged 4th of july, america, couch life, independence day, life on a couch, marines, soldiers, troops, us military, war on July 4, 2014 by Shawn Nelson. 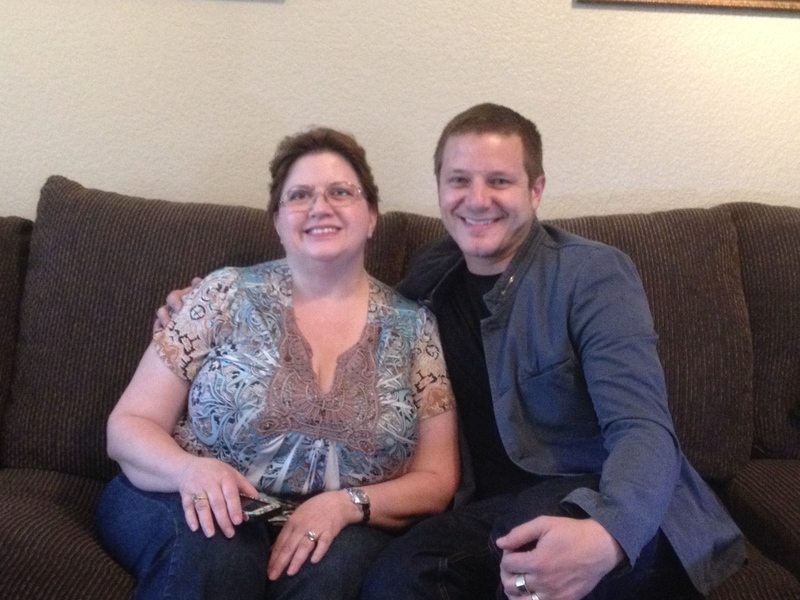 During a recent Lovesac business trip to Las Vegas, I happened upon a new friend by the name of Cathy Bunney. Cathy was kind enough to invite me into her home and tell me a little bit about her life on a couch. Surprisingly she also let me in on some stories from her past as a race car driver- and a little bit about an accident that changed the course of her life forever. In the time I spent with Cathy on her couch in her modest Nevada home, I was once again reminded of the unifying lifestyle we all share on a couch. She told me about how her couch acted as a place of healing after her surgeries and how her family congregated there to watch television together. We sat around on that same couch as she showed me pictures of the cars that she raced to victory- and the trophies she now holds as a result. Cathy Bunney and I on her couch in Las Vegas. Cathy’s story, like the other episodes in this series, is uniquely different and strikingly similar at the same time. Although everyone’s life on a couch is unique when looked at on its own, all of the stories share a common theme of love and togetherness, solace and relaxation. As Cathy says at the end of the interview “There’s nothing like a comfortable couch to come home to.” I couldn’t agree more. This entry was posted in Design, How's Your Couch Life Interviews, Interviews, Travel log and tagged Couch, couch life, couch life interview, Family, las vegas, life, Lovesac, race car, Sactionals manufacturing, sofa, television on June 23, 2014 by Shawn Nelson. Couch Life in the Gobi, How Different Can it Get? As the dramatic photos from my previous post (part 1 of this series) revealed, I took some time on my most recent business trip in China to get as far away from “factory” China and “tourist” China as possible. In my wanderings I was invited onto the living room couch of a complete stranger—a mechanic named Mao, whom I met by happenstance in a back lot, off of a side street, in a town that is off limits to foreigners and not even accessible by normal means. Mao was kind enough to show me his home, and even let me film part of our conversation. I asked him some of the same questions I like to ask everybody about their couch life. Sure enough, Mao had a life on a couch too. Watch the clip! You tell me how different it is from yours…. 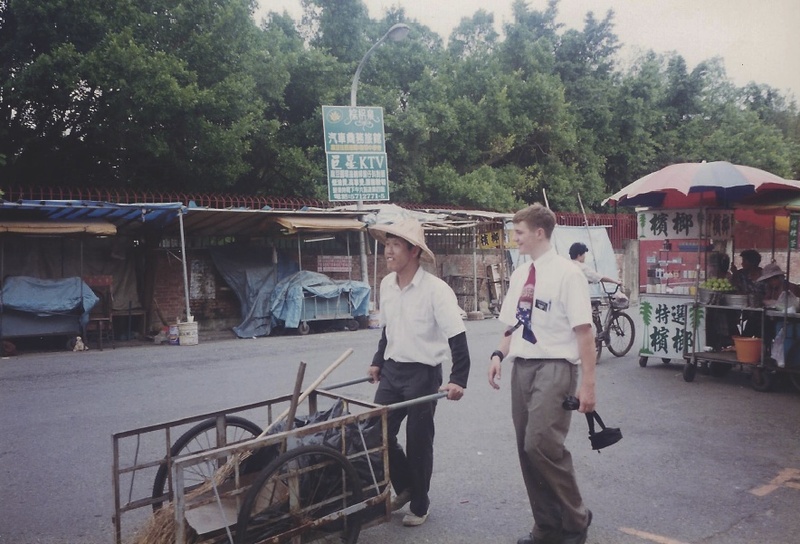 The first time I visited China I was five years old. This was in 1982, just four years after Nixon made his historic visit opening up China again to the west. 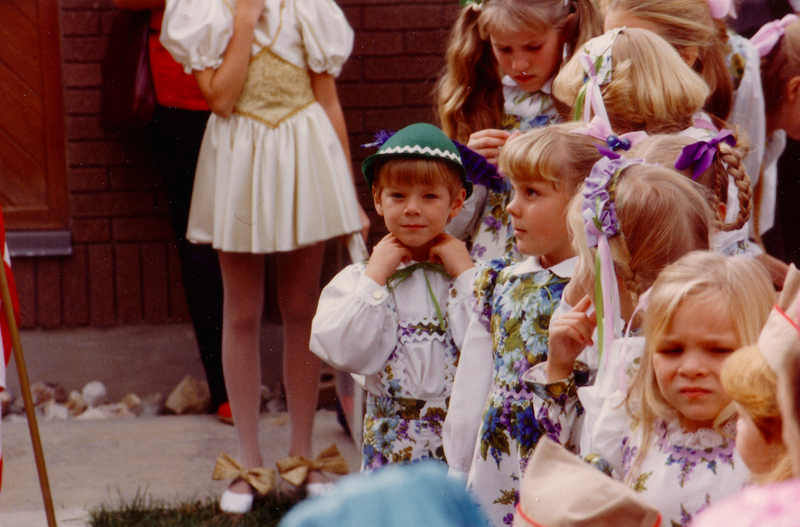 I was part of a children’s choir called The Small World Entertainers….And my parents, for various reasons, couldn’t even make the trip with me! I have watched China grow up. I have observed its relentless modernization. I travelled there again at ages 10, and 15 and lived there for years between the ages of 19 and 23. I’ve been blessed with this opportunity to become fluent in Mandarin Chinese and that’s allowed me to really come to know the people. China is not just a place where we make some of our Lovesac products—it is a place that we know and love. That said, nearly all of our new product growth at Lovesac, is made in the U.S.A. This includes Made-in-America Sactionals. MIA Sactionals, by Lovesac are now made in California and Lovesac Sacs have always been Made in America. The pieces that we still make in China are not produced by some faceless “factory” with smoke-stacks. Surprising to many, nearly all Lovesac furniture is hand-made and sewn-by-hand, by very talented people who we know and love. These are real people too and Lovesac is proud to provide jobs for many people in a good environment over there and in the US alike. These are people who, believe it or not, have a life on a couch too. As you can see from my video interview above even in the farthest reaches of the most forgotten places on earth—our life on a couch is not so different. We are not so different. Shawny: What is your earliest memory on a couch? Mao: It was especially old and pretty beat up. Back then life was pretty tough. Shawny: What color was it? Mao: That sofa was made of all wood—you know the kind. That old Chinese style. Nowadays, we’ll often have friends over to eat here—parties. Shawny: How many people can you have on this couch, at this table? Mao: At least seven or eight people right here…This is our kitchen table. The Chinese love to eat. Mao: My wife is in the hospital…She’ll be alright. Its really not a big deal. Shawny: Your son is seven years old? What is his name? Mao: His name is Jiang Tao. We watch TV here…he does his homework here. We eat dinner here and then usually go on a walk. We’re really close. Not just like a father and son only, but like friends. He’s my best friend. Even though I’m the dad and he’s not just my son. He’s my friend. This is life on a couch—and it is interesting, because you are. 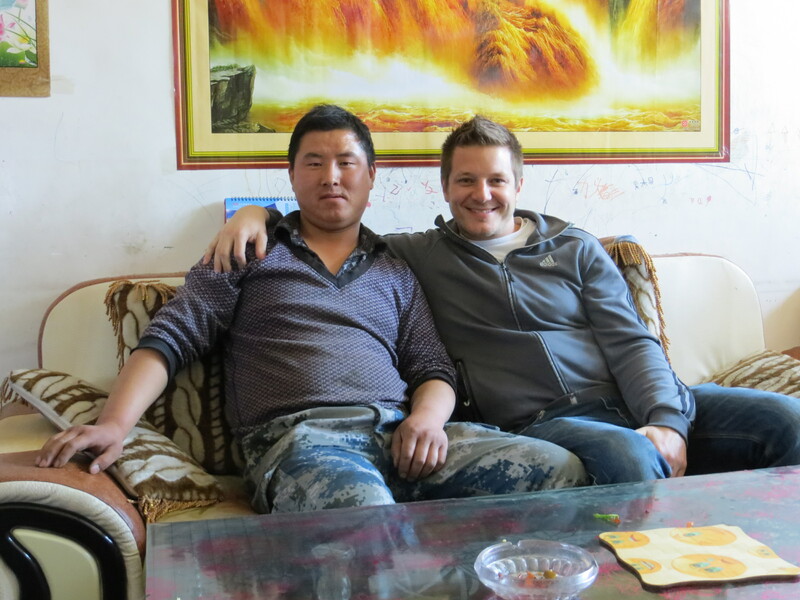 This entry was posted in How's Your Couch Life Interviews, Travel log and tagged China, couch life, couch life interview, Lovesac, made in USA, Sactionals manufacturing, sofa, USA on April 30, 2014 by Shawn Nelson. Take a peek into the couch life Keith Rinzler of Atlanta, Georgia, including all of the stress that comes along with being a serial entrepreneur and single dad. I was recently travelling through Atlanta and I had the chance to sit down with my good friend Keith in his own home. Keith knows all about all of the stress and pressures of an entrepreneur growing a business, and a single father raising three teenage kids. I love hearing from successful and totally unique people like Keith because it just reaffirms my belief that we all have a life on a couch—and we are all more alike than we are different. Some of our best memories in life happen on or around our silent sofas. See how Keith relies on his couch life to de-stress and bring his family together. Post by Life on a Couch. “My Couch Life” Interview with Keith Rinzler, of Atlanta Georgia. Read the full transcript. I didn’t mention that Keith also has this crazy Moroccan themed hookah lounge, complete with an audio-sensitive LED light show embedded in the walls behind the draped fabric panel tent that envelopes the entire room. Talk about a stress relieving environment! 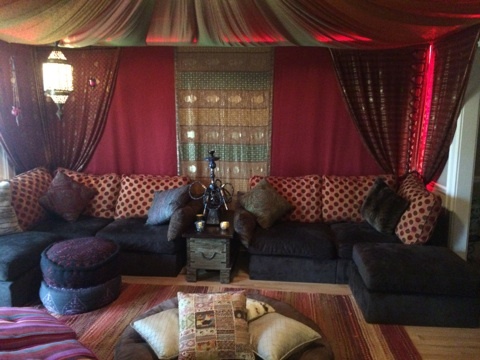 The seating for this hookah room is, of course, all Sactionals by Lovesac and a Pillowsac too. When asked, “What is the craziest thing that’s ever happened in this hookah room?” Let’s just say, Keith declined to comment. Shawny: What was your early memory of your life on a couch? Keith: It was itchy—it was kind of a wool, itchy material I remember, it was kind of a white-beige color. You know, its in the living room, and every once in a while we would just get in a mood and start building. And I’ve carried that forward to my kids, and we’ve built couch castles in the basement. And my kids have slept in them—they’ve taken it to the next level, they’ve built couch castles and then they cover them with blankets so its totally dark on the inside. Shawny: What about your everyday couch life, today? Shawny: What is your craziest memory involving a couch? Keith: As my kids get older and they want to spend a little less time with their parents and they want to go do other things—those times when we sit together and all watch something together and kind of comment on it and just have that time—that’s what I think of. This is life on a couch – and it is interesting, because you are. This entry was posted in How's Your Couch Life Interviews and tagged 1Q, burning man, couch life, couch life interview, Entrepreneurs, father, hookah lounge, keith rinzler, shawny nelson, stress, teenage kids on March 26, 2014 by Shawn Nelson.